The mid-Norfolk parish of Weston Longville is situated between the A47 Dereham road and the A1067 Fakenham road, about ten miles northwest of Norwich. The parish has a long history, and was certainly well established by the time of the Norman Conquest, its population, land ownership and productive resources being extensively detailed in the Domesday Book of 1086. The earliest dateable evidence of human activity comes in the form of Neolithic flint tools, consisting of two axeheads, one chipped (NHER 7716) and one polished (NHER 7715), flakes (NHER 15460 and 23772) and a leaf-shaped arrowhead (NHER 7717). The Bronze Age has left evidence of the earliest visible structure in the parish, a round barrow (NHER 7718) in The Warren. This is a tree and bracken-covered bowl barrow, about 42m in diameter and 2m high, somewhat damaged by rabbit burrows. It was part of a much larger barrow cemetery (NHER 50622 and 50646), known from aerial photographs, which extends into the neighbouring parish of Morton on the Hill (NHER 7729, 7730). Bronze Age finds consist of part of a copper alloy axehead (NHER 49798) and two swords ploughed up in 1954 (NHER 3051). There is the possibility that cropmarks to the north of the parish near to the A1067 might represent a prehistoric enclosure (NHER 50659), if they are not of geological origin. There is only one Iron Age findspot, but it is a spectacular one. A hoard of two to three hundred silver Iceni coins and a few early Roman coins (NHER 7720) was found in a pottery urn by men digging a ditch in 1852 near Top Farm. A further Roman coin and pieces of Roman pottery were found in 1988. Recent work by the Norfolk National Mapping Programme on aerial photographs of the parish has identified five areas of possible Iron Age or Roman enclosures, two towards the north end of the parish (NHER 50660 and 50674) and three to the east of Weston Green (50607, 50610 and 50615). Other Roman finds are pieces of pottery (NHER 7721). The only Saxon find so far is a disc brooch (NHER 34459). The medieval period has left the parish with its oldest surviving building, All Saints’ Church (NHER 7749). 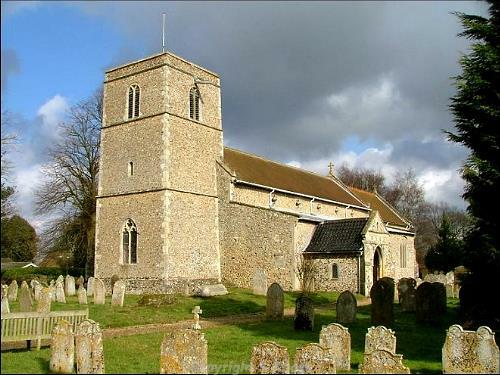 This is a large, very pretty and well-maintained flint, brick and stone church, consisting of a small 13th century west tower, a 14th century aisled nave with a clerestory, a 14th century chancel and a 15th century south porch. The church is best known for its association with Parson James Woodforde, who was Rector here from 1776 until his death in 1803, and whose famous diaries of village life are still read today. His memorial can be seen in the chancel. However, the church also has a great number of interesting features that survive from the centuries before Woodforde was alive. Over the porch is an empty niche, above which is a shield of the Company of French Merchant Adventurers, a company incorporated by Edward IV. The 14th century south door has long hinges and retains its original closing ring. Inside the tall 14th century arcades give a nice sense of space. The tower arch has a modern screen, glazed at the top to light the ringing chamber (the bells were restored in 1976 and are excellent). To the right of this is a portrait of Woodforde himself, painted by his nephew in 1806 from a sketch taken in 1785. The plain octagonal font is probably 13th century and is supported on four Purbeck marble columns. Built into the step to the west of the font is a probably Late Saxon crucifixion carving, the church's oldest feature. On the north aisle is a large and particularly good 14th century painted Jesse tree (a family tree of Christ). The chancel arch is flanked by two other 14th century paintings, one of St John the Baptist and one of St John the Divine. The beautifully preserved 15th century rood screen has a dado with (much restored) painted panels of the twelve disciples under interlacing arches of tracery. Other features of interest include a rood stair, good 17th to 19th century floor tombs, a brass to Elizabeth Rokewood under a mat in front of the lectern, an Edwardian pulpit, a Royal Arms of George III, a box pew, an organ of 1906, some old stained glass in the south aisle windows and a fine piscina and a sedilia depicting two green men in the chancel. The building was restored in the 1800s. Weston Hall or Tye Hall (NHER 7722) is a 16th century two storey red brick country house, T-shaped in plan and much altered, possibly containing the remains of an earlier house. The earlier wing is to the east and has some brick diapering still visible. The house has a two storey porch with a segmental head and Doric pilasters and a good door frame of about 1600. The upper part of the porch has a coat of arms and a date of 1606. The later range running north to south is probably 18th century. 20th century extensions are to the north and west. Old sources refer to a medieval moated timber framed house on the site, though the original shape of the moat is now difficult to assess after much recent garden landscaping. On Hungate Common is a former area of a post medieval (and possibly medieval) settlement (NHER 40462), demolished when the World War Two airfield (NHER 3063) was built and now below a bark-processing site. Of the post medieval buildings to survive, possibly the oldest is the barn in Weston Park (NHER 46077), a 16th and 17th century thatched timber framed threshing barn, partly weatherboarded and partly plastered. Later pantiled lean-tos project from the north end. Old Thatched Cottage (NHER 41022) is a thatched building that is said to date to about 1600, and has a fine fireplace and bread oven internally. It is now entirely concealed beneath modern brick and plaster. 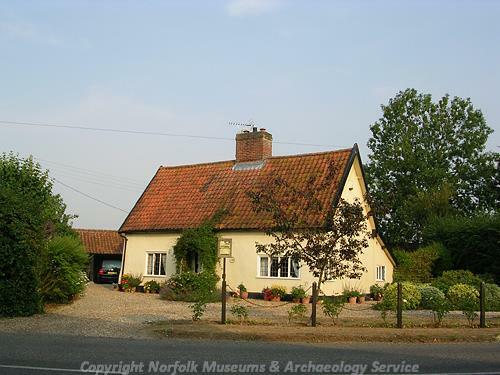 Green Farm House (NHER 20969) on Frans Green is an early 17th century red brick farmhouse, two storeys high with dormer attics under a black glazed pantile roof. The building may enclose parts of an earlier house. To the rear are a later lean-to and a one storey gabled wing. In the kitchen there are moulded beams and chamfered joists. Also 17th century in origin are Willows Farmhouse (NHER 20970) on Heath Road, The Woodlands (NHER 20986) on Morton Lane and The Old Hart (NHER 25083) on The Street. Also on The Street is Church Farmhouse (NHER 45948), a late 18th century two storey red brick farmhouse, a remodelling of an earlier house, with later additions and alterations. The Old Rectory (NHER 45947) on Rectory Road is a late 18th to early 19th century two storey red brick former rectory, now a private house. The symmetrical façade has a central doorway with an architrave and Doric pilasters. A small one storey wing projects to the north. Weston Park (NHER 33733) is a post medieval landscape park associated with Weston House (NHER 7723), which was a three storey house of 1781 in the Adams style, demolished in 1926 after the interiors had been sold off, and the rubble used in the construction of the new Lenwade bridge. The stables remain, converted to a house, but the outline of the demolished building can be seen from the air. The park was probably established in the late 18th century, possibly in 1778 and was extended several times during the 19th century. Some of the woodland within the park is ancient, with other sections dating to the 18th, 19th and 20th centuries. A walled kitchen garden survives, as does a garden house (NHER 46007). A large part of the park is now the Dinosaur Adventure Park. Work on aerial photographs has identified several areas of cropmarks of probable medieval or post-medieval fields in the south-east corner of the parish, to the east of Weston Green (NHER 50608, 50609, 50614, 50616, 50619 and 50620). A large airfield (NHER 3063) was constructed in the parish in World War Two and used by the RAF and the USAAF during the 1940s. Most of the runways and perimeter tracks survive, and a variety of buildings, bunkers and structures are recorded under individual numbers (see NHER 40729 to 40762). The site was called 'Attlebridge' airfield, although curiously no part of it falls within that parish. It was probably named, as was the custom of the time, after the nearest railway station. Some of the runways are currently occupied by battery poultry sheds. P. Aldridge (NLA), 30 August 2007. D.Gurney (NLA), 10 March 2008.